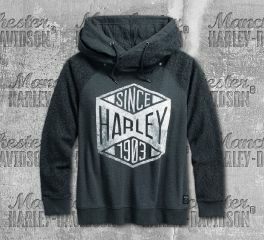 Some things never go out of style, like Harley-Davidson women's hoodies and hooded sweatshirts. 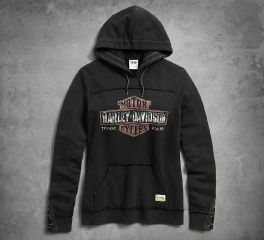 Whether it's zip-up or pullover, black or fleece, there's something for every H-D enthusiast. 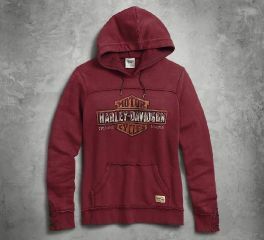 Harley-Davidson® Women's Roses Sweater Hoodie is made from 100% cotton. This 1/4 Zip Hooded sweater is cut from soft fleece and decorated with spots of color on the hood and on the zipper. A striking rose motif draws attention to itself - the graphics are actually reflective! This Ladies Hoodie is versatile with jeans for a day or jogging for a round at the gym. 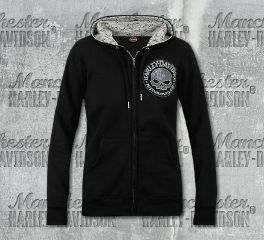 Harley-Davidson® Women's Metallic Skull Long Sleeve Hoodie is made from 60% cotton, 40% polyester fleece. It features a metallic, embroidered graphics, kangaroo-style pockets, full-front zipper, rib-knit cuffs, and rounded drop hem. 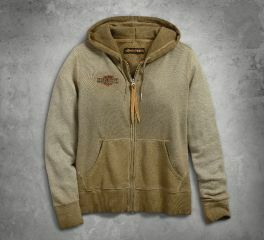 This women's hoodie zips over tees and tanks to acut the chill and keep you out there. 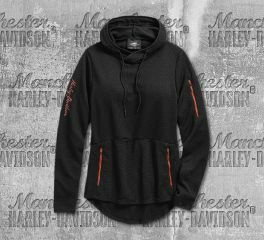 Harley-Davidson® Women's Performance Mesh Accent Hoodie is made from 90% polyester, 10% spandex jersey. It features a reflective side panels, bungee cord and toggle hood is lined, rounded drop hem, extended cuffs and thumbhole, zipper front, and zipper hand warmer pockets. It also features a high-density graphics, and perforated panels for cooling airflow. 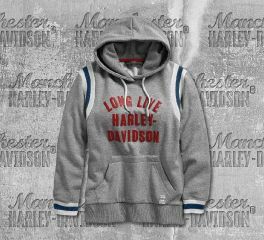 Harley-Davidson® Women's No. 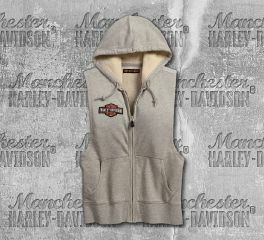 1 Skull Hoodie is made from 60% cotton, 40% polyester fleece. It features a kangaroo-style hand warmer pockets, full front zipper, rib knit cuffs and waist, drawstring hood, printed graphics, and woven label. 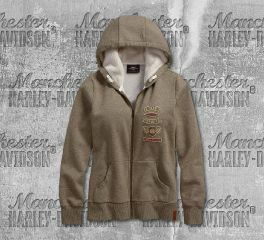 Harley_Davidson® Women's Sherpa Fleece Lined Hoodie is made of 70% cotton, 30% polyester fleece. 100% polyester Sherpa fleece hood lining. It features an integrated drawstring hood, rib-knit cuffs and waist, pocket rivets, kangaroo-style pockets, and full front zipper. 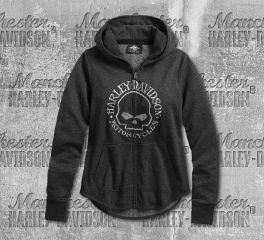 Harley-Davidson® Women's Black Sparkle Hoodie Sweater is made from 70% cotton, 30% polyester. It features a full-front zipper, and skull graphics printed on left chest. 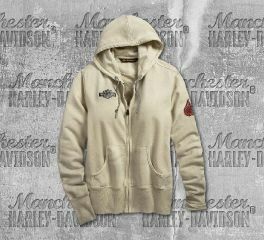 This sweater is finished with our exclusive Manchester Harley-Davidson® Washed Down Eagle dealer backprint. Vintage tiger graphics pulled from an old tattoo design claim space on this women's hoodie. Extra width in the rib-knit cuffs and waist score style points on the comfy, oversized Embroidered Tiger Hoodie. Graphics: Single color embroidered graphics with full-color overprint. Embroidered felt patch. Tonal embroidered graphics. 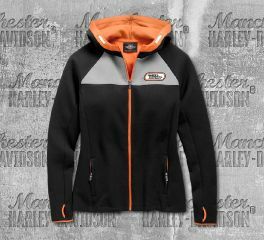 The H-D® Racing Hoodie is a staple for the race enthusiast. Warm double-knit construction and thumbholes are practical on cool days at the track. 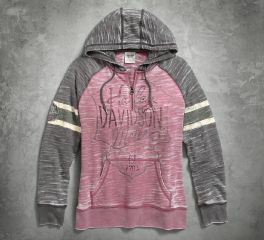 Bold embroidery and high-contrast hood lining on this women's hoodie take inspiration from racing graphics. And the integrated drawstring solves the annoying issue strings flapping in the wind. Material: Four-way 79% cotton, 16% polyester, 5% spandex double knit. Rider-Friendly Features: Integrated drawstring hood. Extended cuffs with thumbholes. Design Details: Reverse side of double-knit is contrasting color. Contrasting inner back yoke lining. 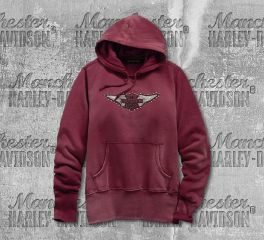 Our vintage-inspired Eagle Hoodie is pre-loaded with a worn and faded finish. 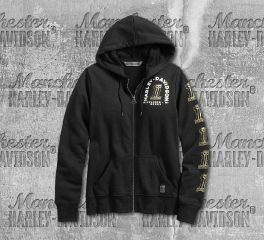 It's thanks to a carefully hand-applied treatment that adds depth and character around the hood, cuffs, and hem of this timeless women's hoodie. Signature graphics include a roughed up chest patch and hearty felt appliqué on back. A masterpiece of soft fleece, mesh inserts, and anniversary accents. The 115th Anniversary Hoodie presents a classic silhouette but with the unexpected additional of mesh inserts at the shoulders. Pops of signature anniversary blue (contrasting stitching). A distinctive allover pattern bumps up the wow factor on the Burnout Sleeve Stripe Hoodie. We swap the classic zipper front for a fun pullover style with a simple 1/4-zip. Women's hoodies with jeans are a no-brainer, but also try this layer with any of our comfy activewear pants. Distressed printed graphics remind you this layer is all about laid-back style. 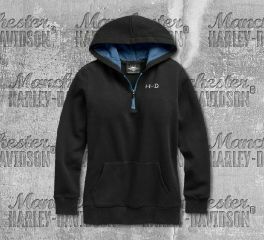 Perfectly faded with raw-edges for a worn-in look, the Genuine Pullover Hoodie sports twill tape trim around the hood and lacing on the cuffs. 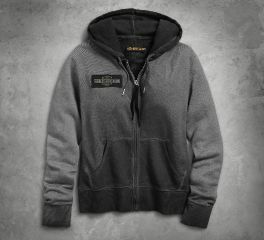 The traditional Bar & Shield logo (distressed for a vintage vibe) is printed on the front of our women's hoodie.